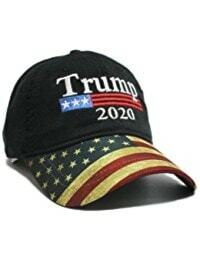 Trump 2020 USA Flag Bill Keep America Great Black cap. 100 % cotton. Soft crown, 6 panel cap. Matching black fabric under visor, flag fabric on top only. Adjustable hook and loop closure. Vintage. High quality premium head wear.